Julia is feted in her centenary year. 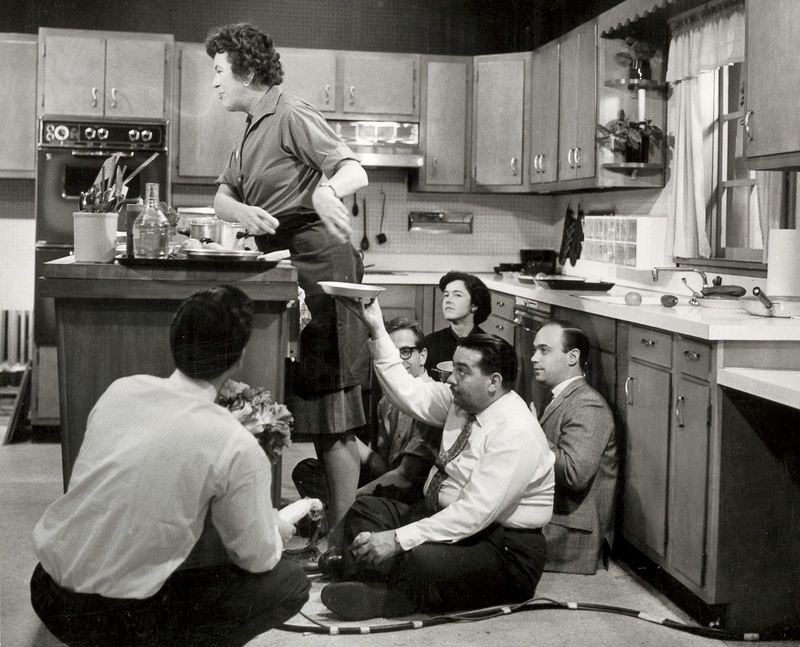 Watchers of Julia Child’s TV show The French Chef marveled at how she disposed of dirty pans and kitchen debris by simply handing stuff down beneath her countertop. Was she putting it temporarily on a shelf out of sight, or was there a little man down below to receive it? Turns out there was a multitude around her ankles, at least in the promotional shot (top right) made in 1964 by her husband, artist and retired diplomat Paul Child, in the Cambridge Gas and Electric kitchen. The photograph is from the vast Julia Child collection in the Schlesinger Library at the Radcliffe Institute for Advanced Study, which includes 5,000 cookbooks donated by her, her book drafts, the voluminous and often funny letters of Julia and Paul, television scripts and production notes handwritten by Paul, some 20,000 photographs by him, film, audiotapes, a gaudy Cordon Bleu medal, and a formidable whisk. 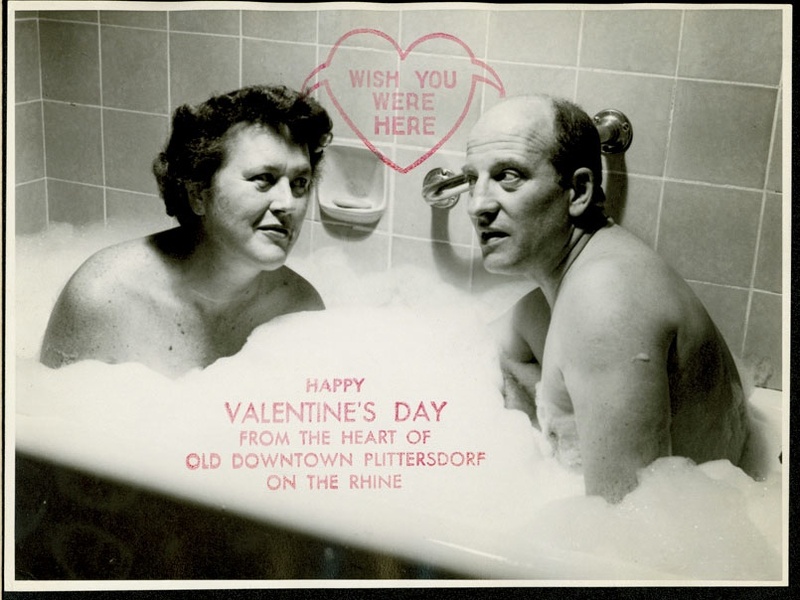 The happy couple liked to send Valentine’s Day cards instead of Christmas cards; the one shown here dates from 1956. The library has staged a number of events to mark the charismatic chef’s hundredth birthday and has sampled the collection in a charming exhibition called Siting Julia, up through March 2. Put together by Marylene Altieri, curator of books and printed materials, the display focuses on Julia in post-World-War-II Paris, in Cambridge, and on television. 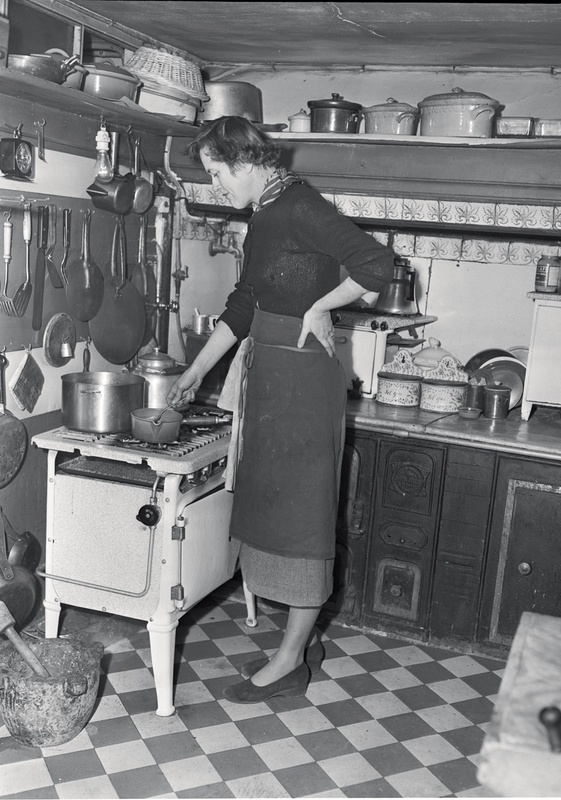 At top left, she looms over the stove (she was six-feet, two- or three-inches tall) in the furnished apartment she and Paul rented at 81, rue de l’Université. Julia studied cooking in Paris and taught it, with two French colleagues, in this kitchen. She was keen to understand why things worked—or didn’t. Why wouldn’t a French recipe for a pie crust work with American flour? Because French flour had a much higher fat content. The great Mastering the Art of French Cooking appeared in 1961. Her television career began in 1963. In 1966, she won an Emmy; the splendid thing is in the exhibition.